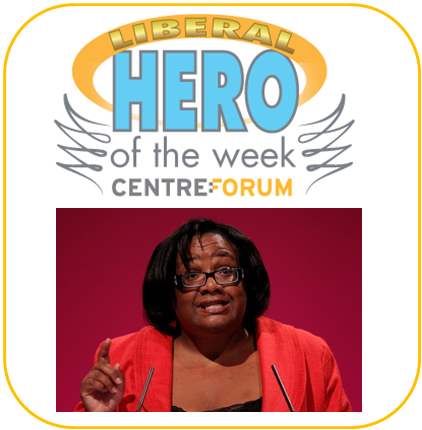 Liberal Hero of the Week (and occasional Villains) is chosen by Stephen Tall, Co-Editor of Liberal Democrat Voice, and Research Associate at CentreForum. The series showcases those who promote any of the four liberal tenets identified in The Orange Book — economic, personal, political and social liberalism — regardless of party affiliation and from beyond Westminster. If they stick up for liberalism in some way then they’re in contention. If they confound liberalism they may be named Villains. I am in love! The hon. Lady is absolutely right, and if I had been a member of the Labour party I would have voted for her to be leader. Ms Diane Abbott (Hackney North and Stoke Newington) (Lab): The Secretary of State will appreciate that I cannot speak about the detailed implementation of his reforms, but does he agree that an emphasis on rigorous qualifications and on obtaining core academic subjects is not, as is sometimes argued, contrary to the interests of working-class children and of black and minority ethnic children? On the contrary, precisely if someone is the first in their family to stay on past school leaving age, precisely if someone’s family does not social capital and precisely if someone does not have parents who can put in a word for them in a difficult job market, they need the assurance of rigorous qualifications and, if at all possible, core academic qualifications. My parents left school in rural Jamaica at 14. They migrated to Britain where my mother was a nurse and my father was a sheet metal worker. Growing up, I didn’t know anyone who had gone on to higher education. In fact I did not know anyone who did anything other than the standard occupations of working-class West Indians of the era: nursing, public transport, factory work and manual labour. No one in my family circle had any practical advice to give, any strings to pull or any contacts to help me in the world of white-collar work. To make matters worse, I was obstinately left-wing. So I owe everything in life to my string of A grades at O- and A-level and my Cambridge degree. I did not know at the time what a phenomenon it was for a working-class black girl to have acquired a string of academic qualifications. But I have grown to understand the benefits of academic rigour. I chose Michael Gove as a Liberal Hero a year ago. As I said then, I don’t agree with all his policies or pronouncements. * Too often his restless search for creative disruption in the education system risks over-correcting. He has virtually abolished local education authorities without thinking through what should replace their convening role or how effective practice can be spread without them. Academies and free schools are now directly accountable to him as Secretary of State: that is centralisation of our schools on a breathtaking (and, make no mistake, worrying) scale. His devotees in the right-wing media, most notably The Spectator, happily gloss over such flaws. For them it is enough that he is seeking to unleash competition through the creation of free schools. However, Michael Gove has driven forward the agenda on higher standards in schools and how crucial they are for those from the most challenging backgrounds. For that he deserves a decent dollop of credit. Good on Diane Abbott for giving praise when it is due. * The Times’s Tim Montgomerie recently divided Gove-doubters into three categories. First, those ‘local education authorities, Department of Education bureaucrats and the unions that have defended under-performing teachers over too many decades’. The “enemies of promise” as Mr Gove would term them. Second, ‘many thoroughly reasonable members of the teaching profession who have genuine reservations about the dizzying scale of change’. And third, those who regard Mr Gove’s record as something of a contradiction: exhorting school freedom while seeking to micro-manage standards and the curriculum. I’d place myself in both the latter two camps. You can view our list of ‘Liberal Heroes of the Week’ (and occasional ‘Liberal Villains’) here. Nominations are welcome via email or Twitter.